Today we’d like to introduce you to Lauren Quinn. I’m an LA native who found herself living in India, the south of France, London, San Francisco and South America over the past fifteen years. I indulged in a variety of things throughout the decade and a half from studying language, to working for a design firm, volunteering with street children, writing speeches for Ambassadors, personal assisting at Mayor Willie Brown’s office and even serving late night Scotch in a turn of the century whiskey bar. In 2014, I arrived on a solo trip to Rio de Janeiro and never looked back. I felt alive in a way I was longing for and felt deeply connected to a country that I have never stepped foot in. I decided to go home and immediately move back to start a new life. I set up shop and began a Brazil Travel Concierge Company, Bromelia Travel, but I couldn’t shake a passion for swimwear. In early 2017, the colors and patterns couldn’t sit still any longer in my mind, and the first seeds of Bromelia Swimwear were planted. I adore the confident and calm way Brazilian women held themselves at the beach and wanted to translate this into pieces that made American, European and Australian beach go-ers feel equally as good in their own skin. Today our Online Shop is thriving and turning the heads of Vogue, Harper’s Bazaar, and Elle. It has been a stunning road made up of potholes. In addition to weathering the normal storms of starting a brand and growing its identity, navigating the difference in business cultures was a major hurdle. I am very familiar with Brazilian culture, I speak Portuguese and lived in Brazil for years; however, navigating the business culture was a major test of patience. But the pure belief in this product and especially in the local group of women who poured their hearts into creating it made the struggle worth weathering. It is equally important for me to continually support the design efforts of these women with further collections so that they can continue to grow their own small businesses. 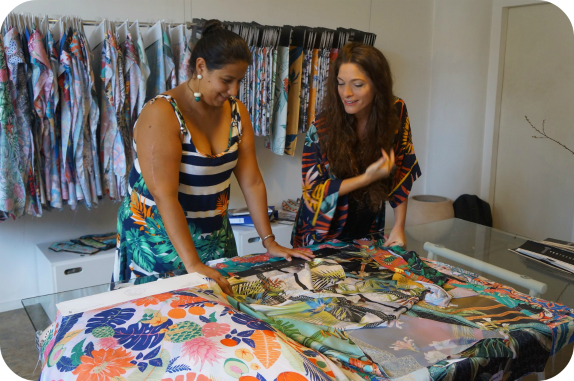 The Brazilian economy has been having a difficult few years, and I want to see women artisans continue to thrive and make a living from their craft. Please tell us about Bromelia Swimwear. I am the CEO and head designer of Bromelia Swimwear, a luxury line of Swimsuits designed and hand-made in Rio de Janeiro, Brazil. We are available online and ship from our warehouse in LA. I wanted to capture the essence of Brazil and blend it with that classic California vibe. I wanted to share what was gorgeous about life there with the rest of the world. Not everyone can fit a trip to Brazil into their lives, so I endeavor to bring a bit of Brazil to the world. Being from California, growing up in flip-flops and bathing suits, I wanted to add in a touch of the deliciously familiar, but take it up a notch. Our swimsuits are not your ordinary bathing suits. Bromelia Swimwear has been designed to highlight and celebrate the women’s figure, flattering every angle, slimming all the right corners and accentuating the best parts of who you are. Every suit was carefully thought out before production, to ensure that each piece bears in mind your beautiful curves while still being easy to wear. Using only the softest materials, unique patterns and seamless stitching, our suits are made to accessorize a woman’s natural beauty. In old Portuguese colonial warehouses in downtown Rio, we spent days on end, up to all hours of the night, for an entire year, until we had created an entire collection to bring to LA to sell. I’m incredibly proud of making such a luxurious suit available outside of Brazil for under $100. I don’t cut any corners, find only the best available and use incredible craftsmanship. I want you to put your suit on and not have to worry about anything else but the sunshine. I would have been more forgiving of myself, to not expect perfection right out the gate. A brand needs nourishment and time to grow. It is not something designed on paper and stays static once in the air. It is a living thing, and changes form along the way as you discover what works and what doesn’t. But the mistakes I made were the absolute best part of the business. Because it was from them that I was able to truly identify just what is Bromelia Swimwear.